Volodymyr the Great (Valdamar, Volodimer, Vladimir), b ca 956, d 15 July 1015 in Vyshhorod, near Kyiv. 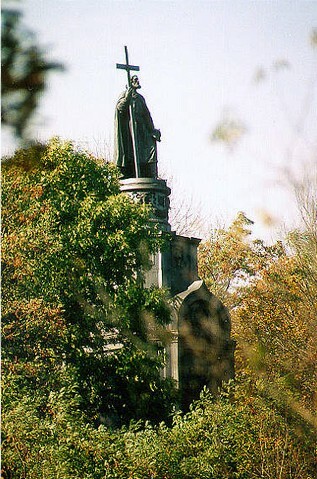 Grand prince of Kyiv from 980; son of Sviatoslav I Ihorovych and Malusha; half-brother of Yaropolk I Sviatoslavych and Oleh Sviatoslavych; and father of 11 princes by five wives, including Sviatopolk I, Yaroslav the Wise, Mstyslav Volodymyrovych, and Saints Borys and Hlib. In 969 Grand Prince Sviatoslav I named his son Volodymyr the prince of Novgorod the Great, where the latter ruled under the guidance of his uncle, Dobrynia. 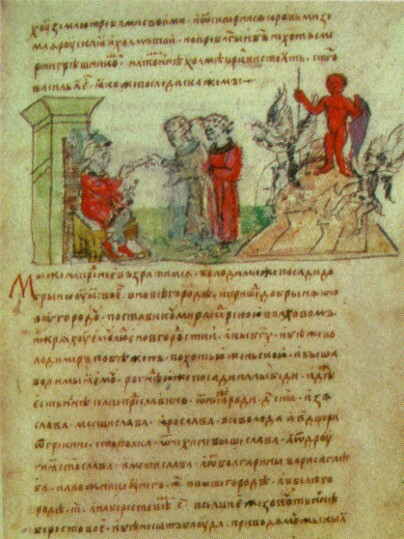 In 977 a struggle for power broke out among Sviatoslav's sons. Yaropolk I, who was then the grand prince of Kyiv, seized the Derevlianian land and Novgorod, thereby forcing Volodymyr to flee to Scandinavia. In 980 Volodymyr returned to Rus’ with a Varangian force, expelled Yaropolk's governors from Novgorod, and took Polatsk after a battle in which Prince Rogvolod of Polatsk was slain. Volodymyr took Rogvolod's daughter, Rohnida, as his wife. Later that year he captured Kyiv and had Yaropolk murdered, thereby becoming the grand prince , and married Yaropolk's Greek widow. Over the next 35 years Volodymyr expanded the borders of Kyivan Rus’ and turned it into one of the most powerful states in Eastern Europe. After taking the Cherven towns and Peremyshl from Poland (981) and waging successful wars against the Viatichians (981–2) and Radimichians (984) he united the remaining East Slavic tribes, divided his realm into lands, and installed his sons or viceroys to govern them, dispense princely justice, and collect tribute. In 983 Volodymyr waged war against the Yatvingians and thereby gained access to the Baltic Sea. In 985 he defeated the Khazars and Volga Bulgars and secured his state's eastern frontier. Volodymyr devoted considerable attention to defending his southern borders against the nomadic Pechenegs and Chorni Klobuky. He had lines of fortifications built along the Irpin River, the Stuhna River, the Trubizh River, and the Sula River and founded fortified towns (eg, Vasylkiv, Voin, and Bilhorod) that were joined by earthen ramparts. Volodymyr attributed his victory over Yaropolk I Sviatoslavych to the support he received from pagan forces, and had idols of the deities Perun, Khors, Dazhboh, Stryboh, Symarhl, and Mokosh erected on a hill overlooking his palace in Kyiv. Later he became convinced that a monotheistic religion would consolidate his power, as Christianity and Islam had done for neighboring rulers. His choice was determined after the Byzantine emperor Basil II turned to him for help in defeating his rival, Bardas Phocas. 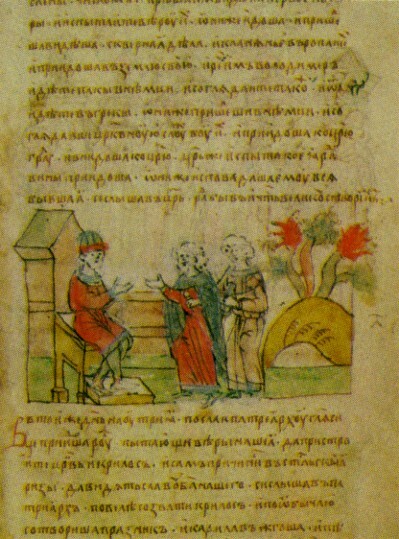 Volodymyr offered military aid only if he was allowed to marry Basil's sister, Anna, and Basil agreed to the marriage only after Volodymyr promised to convert himself and his subjects to Christianity. Volodymyr, his family, and his closest associates were baptized in December 987, when he took the Christian name Vasylii (Basil). Soon afterward he ordered the destruction of all pagan idols. The mass baptism of the citizens of Kyiv took place on 1 August 988 (see Christianization of Ukraine), and the remaining population of Rus’ was slowly converted, sometimes by force. In 988 Volodymyr sent several thousand warriors to help Basil regain power and married Anna, and in 989 he besieged Chersonese Taurica, took it from Bardas Phocas, and returned it to Basil. The Christianization of Rus’ was essentially engineered by Byzantium. Byzantium supplied the first hierarchs and other missionary clergy in Rus’ and introduced Byzantine art, education, and literature there. 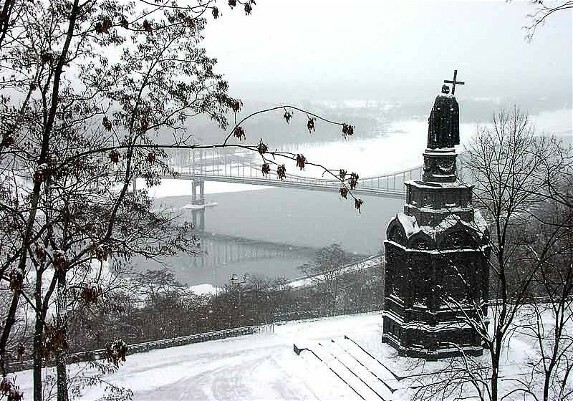 During Volodymyr's reign the first schools and churches were built, notably the Church of the Tithes in Kyiv. The adoption of Christianity as the official religion facilitated the unification of the Rus’ tribes and the establishment of foreign dynastic, political, cultural, religious, and commercial relations, particularly with the Byzantine Empire, Bulgaria, and Germany. Relations with Poland improved after Volodymyr's son Sviatopolk I married the daughter of Prince Bolesław I the Brave in 992. Volodymyr received papal emissaries in 986, 988, 991, 992, and 1000 and sent his own envoys to Rome in 993 and 1001. After Anna's death in 1011, Volodymyr married the daughter of Count Kuno von Enningen. Toward the end of his life his sons Sviatopolk of Turiv and Yaroslav the Wise of Novgorod challenged his rule. Having defeated Sviatopolk, Volodymyr died while preparing a campaign against Yaroslav and was buried in the Church of the Tithes. He was succeeded briefly by Sviatopolk. The Rus’ clergy venerated Volodymyr because of his support of the church, but he was canonized only after 1240. Thereafter he was referred to as ‘the holy, equal to the Apostles, grand prince of Kyiv.’ The oldest extant mention of him as Saint Volodymyr is found in the Hypatian Chronicle under the year 1254, and his feast day, 28 July (15 July OS), was first celebrated in 1263. A referral to this page is found in 94 entries.